Progress on my stash reduction afghan for Project Linus is coming along slow but steady. I never did get that orange yarn, though I would have loved to add orange to this. I just got too far along and gave up on it. It's at the point though, where it is too big and bulky (and hot) to take with me when I go places. For that, I wanted my usually "go" knitting, socks! I told DH I'd make this next pair for him. I handed him Knit Socks! 15 Cool Patterns For Toasty Feet , told him to pick a pattern, and to pick a color. Well, he ended up liking the exact pattern I had just finished for myself (pic of my finished socks here), the "Classy Slip-Up" socks. And what color did he want? Blue and red. Oh dear. For one thing I had just finished knitting a pair of these and wasn't terribly interested in knitting the same pattern so soon. The other thing is that the pattern doesn't exactly lend itself to two color knitting. What to do. 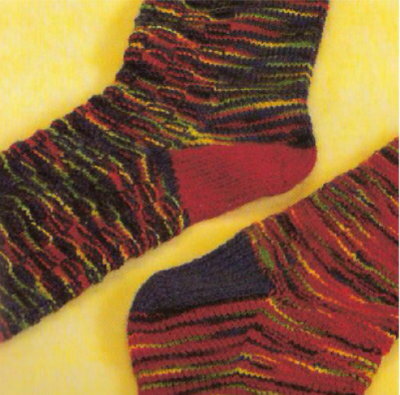 When I pointed the color problem out, DH said, well, he liked the stripy effect of another pattern in the book, the "Checkered Textures" sock. Not an accurate scan of the colors, but you get the idea. You can see the full, original photo on page 97 of Betsy Lee McCarthy's book. The challenge then was how to combine the two sock patterns. I really had to think about this for awhile. My solution is nowhere near the stripy effect of the "Checkered Textures" socks, but he's happy with it, and that's what counts. 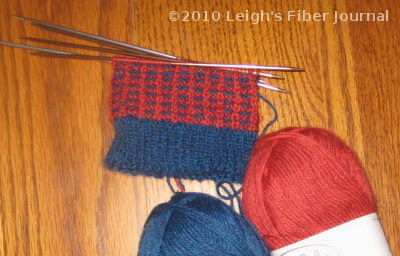 The cuffs, heels, and toes will be knitted in blue, the rest of it alternates the blue and red yarns. The blue row is always the slipped stitch row. 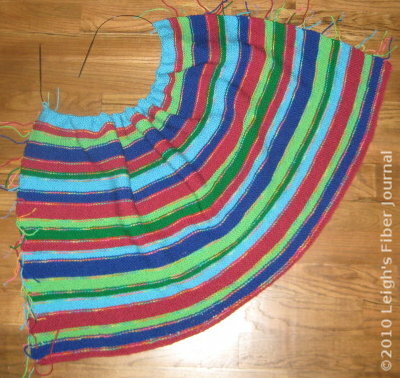 Since it is the red yarn in the previous row that is slipped, the result is red stripes. 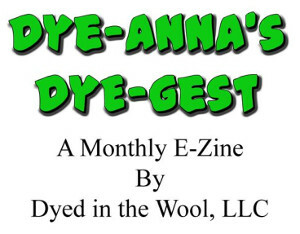 The yarns are from KnitPicks. As with my other projects, these will probably take awhile. But as long as DH can see some progress on them from time to time, he's happy. Stash Reduction Afghan Progress & More Socks photos & text are © 16 April 2010 by Leigh at Leigh's Fiber Journal. I like your choice. I'm not a fan of stripey yarn. 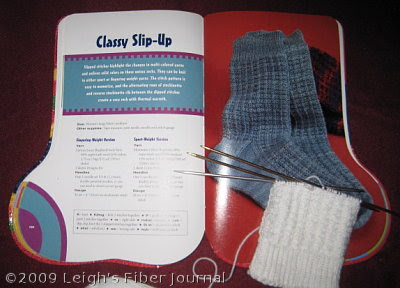 I wouldn't have thought of the slip-stitch pattern for socks as I'd not expect them to be stretchy. I'll be curious to see how they pan out. They look good. Oh you are such a nice wife to give him a choice. I often pick a yarn I like and then slyly ask, "Isn't this lovely, feel it..." He always agrees you know so can't say too much when I tell him "Good, because I was going to make you a pair of socks with it..."
On sweaters though I do give him a few choices. The afghan looks awfully fun! Theresa, *LOL. I'll have to try that technique sometime. Your striped afghan inspired me to create my own. Thanks for the idea! I still have to get to socks!!!! It seems like so much "life" has been going on that when I sit down and just "rest my eyes" for a minute...well, let's just say I'm well on my way to hell. The good thing is that with Ross' mum & dad coming for a visit and to head to BSG with us, it may be the inspiration I need to get me over my hump. I'm sure that you will enjoy knitting the socks no matter how long it takes! I'm working on the shadow box pattern (and have been for about 5 months- progress is charted, no matter how slowly) Although I have to admit that it is hard to thing about socks in a positive way when the hair is melting off of my scalp.